Provide comfort for the family of Rosalie Spurrell with a meaningful gesture of sympathy. peaceful passing in her 100th year, at James Paton Memorial Hospital. 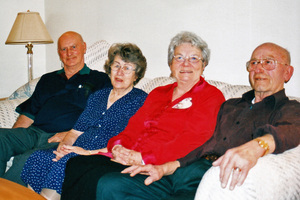 Anne Cleaver; extended family and many friends. Born in St. Anthony, NL, she attended the first integrated school in the province, the Wilfred T. Grenfell School. 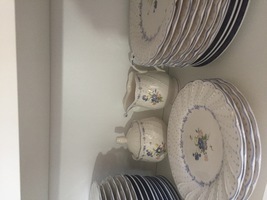 At a young age she realized a great desire to work with young children which led to her life’s work as a Primary school teacher taking her to Memorial College and various teaching positions.Eventually her calling brought her to Gander in 1950 for a one year teaching post that stretched into thirty years until her retirement in 1980. She loved her career as a teacher and never wanted to think of retirement. With many fond memories of her students, their parents, her colleagues, she often reminisced about her experiences, thankful to all who helped make her years of teaching so wonderful. Rosalie always maintained “Teaching is a very rewarding career”. 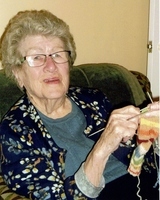 Throughout her years she played an active role in the community as a member of the Women’s Institute where weaving was a passion, a volunteer at the hospital, Kiwanis Music Festival, and various other organizations. Rosalie was a member of the Elks Royal Purple Ladies, a long-time member of the Masonic Ladies Association and was a Lady Shriner. A great ambition for Rosalie was to see other lands which she fulfilled in her retirement travelling with family and/or friends in Canada, the USA, Great Britain, and Continental Europe.She was so happy to see firsthand many countries and landmarks that she had learnt about in her years of schooling. During these travels she met new people and maintained many lasting friendships. Gardening and well-kept grounds were a “must” and a favourite hobby of Rosalie. Even after moving from her home on Hawker Crescent in 2006 to reside with her daughter, Sharon, she lovingly maintained her own little garden. When she was not gardening she was knitting some of the loveliest socks which have literally travelled all over the world. Special thanks are also extended to Dr. Paulus and the staff at JPMH for their wonderful care. She was well looked after by some wonderful and loving people. Health Foundation (James Paton Memorial Hospital) 125 Trans-Canada Hwy, Gander, NL A1V 1P7 or to St. Martin’s Cathedral 2 Lindbergh Road Gander NL. To send flowers in memory of Rosalie Spurrell (Patey ), please visit our Heartfelt Sympathies Store. ANGLICAN PARISH OF GANDER CENTRAL NORTHEAST HEALTH FOUNDATION INC.
Saunders family (Sharon, Barb, Jackie, Howie , Kim sent flowers to the family of Rosalie Spurrell (Patey ). to Sharon and family sorry to hear of your Mom's passing. A lovely lady whom I met so many years as a member of Womens Institutes here in Gander. Our deep condolences..
To Sharon: I heard of your mother's passing through our mutual friend Marguerite. My deepest sympathies to you and all your family. I still treasure, and regularly wear, several pairs of your mother's lovely knitted socks. My thoughts are with you at this time. Catherine Sheehan Victoria B.C.